AMD Ryzen 3000 for laptops has been announced a few months ago and the PC OEMs are starting to release more and more new laptops with these CPUs. 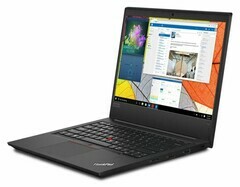 Now, two new Lenovo ThinkPad laptops are listed on the website of the manufacturer. With the new Ryzen 3000 processors, the business laptops ThinkPad E495 and ThinkPad E595 are the direct successors of the E485 and E585. AMD Ryzen 3000 is slowly trickling down into the market. Now, two new models of the well known ThinkPad brand are listed online. Both are powered by the new AMD processors. The Lenovo ThinkPad E495 and the Lenovo ThinkPad E595 are two business laptops of the affordable kind. The ThinkPad E495 has a 14 inch screen and it succeeds the ThinkPad E485, while the ThinkPad E595 with its 15.6 inch screen succeeds the ThinkPad E585. Apart from the newer processors, the new models do not appear to have any new features. The design of the E495 and E595 seems to be completely identical compared with their predecessors. The AMD Ryzen 7 3700U is listed as their fastest processor. The two new Lenovo ThinkPads with AMD processors are listed on the Lenovo UK site, but they are not orderable yet. Considering the small differences compared to their preceding models, it probably will not take very long until both the E495 and the E596 are available.